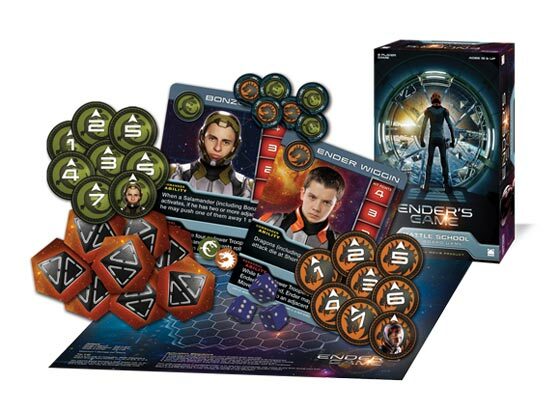 Based on the epic movie from Summit Entertainment and director Gavin Hood (from the Orson Scott Card novel) comes a board game of combat in the null gravity arena of the International Fleet’s Battle School. Two fierce rivals square off to see who has the best strategy and the steadiest trigger finger: Ender Wiggin and his Dragon Team or Bonzo Madrid and his Salamander Team. Characters maneuver around the null gravity arena with various amounts of control over where they will end up each time they move. When you move, you don’t stop until something, or someone, gets in your way. Teamwork is key! Win by capturing your opponents’ gates or by freezing all of his units with your laser-light guns. Dice are used to resolve combat, but strategy and tactics will rule the day. Based on the movie that will kick off the 2013 holiday season, Ender’s Game. Play as one of the two main characters from the movie! Different Commander abilities makes for great replayability! Star terrain pieces allow for customizing the arena. No two battles will be the same! Add a Review for "Ender’s Game Battle School"